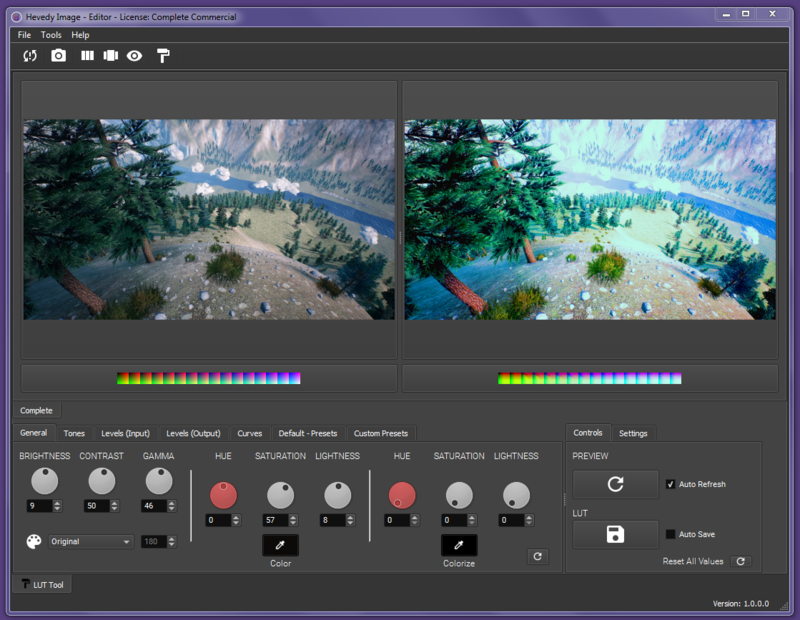 Hevedy Image by Hevedy is an easy to use package of tools designed to speedup the process and the performance in your games. Hevedy - Image Tools provide a faster workflow than any other monthly paid complete Image Suite. 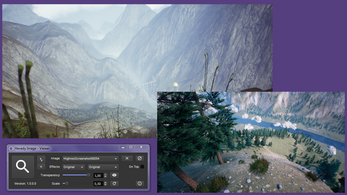 LUT Editor: Create LUT tables and preview the results in real-time for game engines Post-processing or video editing using a set of real-time parameters. 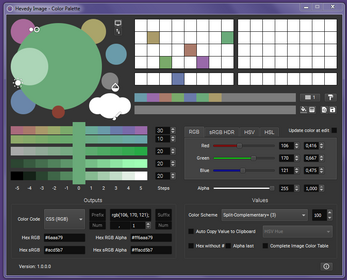 Tones Colorize (Dark, Middle, Light). Color Palette: Get different suggestions of color with different light, intensity etc. You can get the RGB, sRGB value or the Hex values that can be used in the game engines color selectors, in websites or even in other image apps. Generate color palettes from images. Auto HSL, HSV, RGB, sRGB/HDR values. Auto copy to clipboard at edit colors. Hexadecimal values for RGB and sRGB/HDR. CSS/HTML/C++/C# Vectors auto code generation. Export the color palettes as images ready to use in other apps. Export palettes to Gimp, Blender & Krita. Image Viewer: Open different images in your desktop to use as reference in others apps, or just use as image viewer. Overlap other apps, scale and apply filters to the images and lock the images to use as reference to paint or as 3D reference. Lock the images to work without problems. 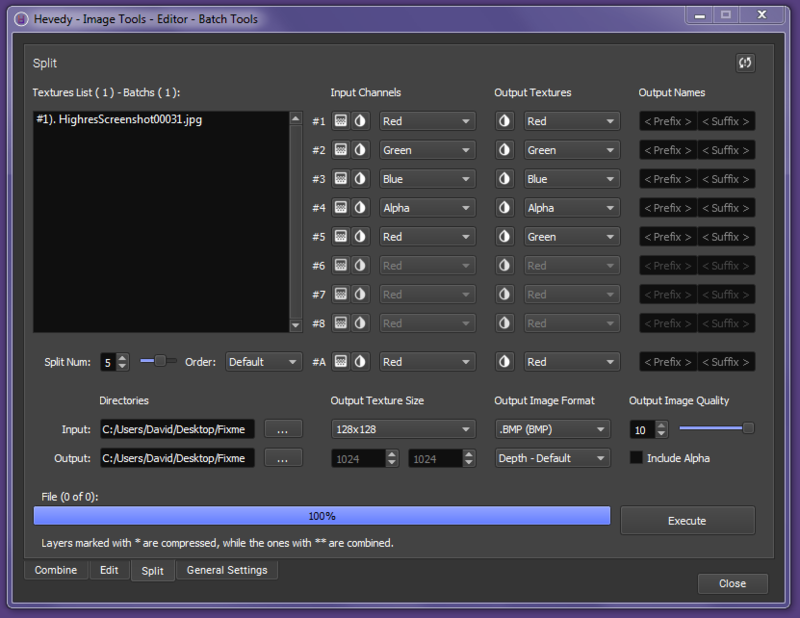 Texture Packager Batch Tools: Can use this tool to combine, split or edit images from folders, you can bulk the whole folder images into different images in an automatic process. 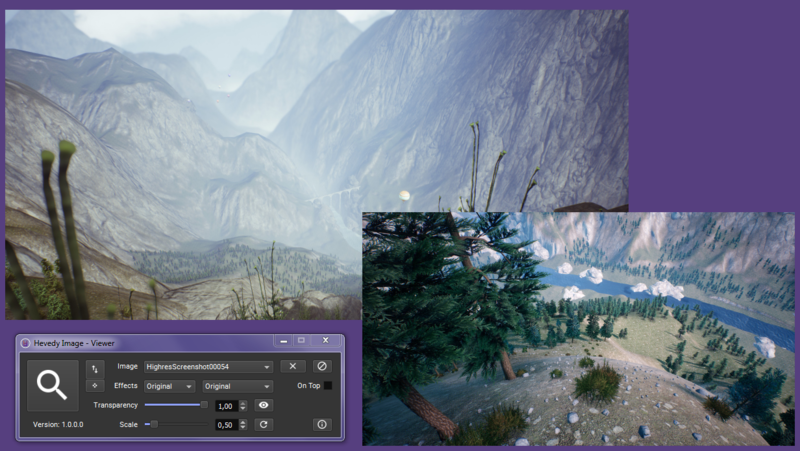 Combine up 4 textures using a single ARGB or up 8*. Combine up 3 textures using a single RGB or up 6*. *6 and *8 uses a method to combine up 2 textures per channel but can't be overlapped to work. Select the input channel and output channels. Select the number of textures per batch. · GPU: Just a decent card that can work with other image tools. · Space: At least 100 MB of free space. Notes: The tools are CPU driven (some components are CPU/GPU driven), there are no plans to port into GPU. All the tools included support the image formats ( .png, .tga, .tif, .jpg, .bmp ) Max image size (4096x4096).  "HEVEDY IMAGE" is under a DRM-Free, royalty-free, platform-independent, non-expiring license. The license is per seat. All the products included in "Hevedy Image" are licensed for *commercial, non-commercial, and *educational use. All the textures, images, noise... generated with "Hevedy Image" can be used for *commercial, non-commercial, and *educational purposes.